Dark Umbreon Swords is a really old card. If you think about it, its been around since LOB, and that's a really long time. Its seen a lot of play, but lately, its been losing its promise in some decks. Its a Magic Card that when played gives you 3 turns of safety from opponents attacks and flips all monster face up, activating their effects. Swords can still see a lot of use. Its annoying especially to have it played against you. I hate nothing more than waiting for 3 turns for my opponent to get draw power and new options. Three turns can make a huge difference. This can see promise in defensive decks and burners, decks that don't have a lot of offensive pull. It gives them time to draw Monster Removal or something to save themselves. Sadly, we have a lot of Magic and Trap Counters and destroyers wandering around. Mystical Space Typhoon and Harpie's Feather Duster can ruin a Swords user's plans. Also, activating an opponents Flip cards can't always be good. Activating them too soon can be a small problem. Overall, Swords is good, but its losing its flare with all the counters roaming around. Effect: Counting from your opponent's turn, none of your opponent's monsters can attack for 3 turns of his/her own. When this card is activated, opponent's face down monsters at that time are turned face-up, but remain in Defense Position. Any effects the monsters may have are immediately activated. Giant Trunade - Play it again, and again. Magic Reflector - Protect it from destruction, but it doesn't stop Giant Trunade. 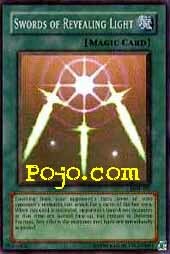 When SoRL first came out its only enemies were Armed Ninja and De-Spell, then with Metal Raider came Heavy Storm and Magic Jammer but also brought Magician Of Faith which helped to reuse SoRL. With Magic Ruler it gained Giant Trunade as a friend but gained its worse enemy MST. Pharaohs Servant brought Dust Tornado, Magic Drain and Imperial Order. Now there is just too many good cards out like HFD, Raigeki Break, Swarm Of Locusts, Moisture Creature, that can destroy SoRL so it's life expectancy on the Field is cut short at least half the time its played or more. SoRL can help in any type of Deck, but its playability has gone down a bit and Deck space is getting too tight for cards we all use to love playing, and tighter it will continue to grow with key cards for different Decks coming out with the next sets released. ArtWork: 3.0 - 3 Swords for 3 turns, not much else I can say.